PennsylvAsia: "Red China's Green Revolution," October 10 at Pitt. "Red China's Green Revolution," October 10 at Pitt. 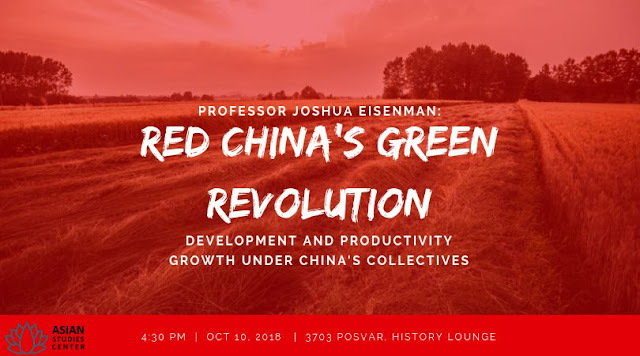 The University of Pittsburgh's Asian Studies Center will host Joshua Eisenman and his lecture "Red China's Green Revolution" on October 10. Joshua Eisenman’s (马佳士) research focuses on the political economy of China's development and its foreign relations with the United States and the developing world—particularly Africa. His work has been published in top academic journals including World Development, Development and Change, Journal of Contemporary China and Cold War History, and in popular outlets such as Foreign Affairs, The Wall Street Journal and Foreign Policy. His views have been cited in The New York Times, The Washington Post, The Economist and The New Republic. Professor Eisenman's newest book, "Red China’s Green Revolution: Technological Innovation, Institutional Change, and Economic Development Under the Commune" (Columbia University Press, 2018), explains how more capital investment and better farming techniques increased agricultural productivity growth in Maoist China. In "China Steps Out: Beijing’s Major Power Engagement with the Developing World" (Routledge, 2018), he worked with Eric Heginbotham to analyze China’s policies toward the developing world. His second book, "China and Africa: A Century of Engagement" (University of Pennsylvania Press, 2012), co-authored with David Shinn, was named one of the top three books about Africa by Foreign Affairs. Their next volume, under advance contract with the University of Pennsylvania Press, will examine the China-Africa political and security relationship. The event runs from 4:30 to 6:00 pm in 3703 Posvar Hall (map) and is free and open to the public. Japanese Conversation Table, November 2 at Pitt. Crazy Rich Asians free at Pitt, November 2. Pittsburgh Chinese School hiring teachers. All-you-can-eat sushi place opens in Robinson. Japanese Conversation Table, October 19 at Pitt. Princess Mononoke (もののけ姫) at Pitt, October 17. 2018 Korean Music Festival, November 3. China Town Hall events at Pitt, October 9. Korean Language Social Hour, October 4 at Pitt. Hug Thai Noodle House coming soon to Oakland. Bunkasai at Pitt, October 6.